One of the greatest benefits to aluminum metal stamping is its low price tag. Metal stamping is a highly automated process, lowering labor costs significantly. Because labor costs decrease as production levels increase, aluminum metal stamping is especially cost-effective for high-volume production. Aluminum stamping is also inexpensive due to aluminum’s light weight, which lowers transportation costs after production. The level of automation in metal stamping also makes it a very fast process compared to other metal-shaping methods. In the electronics industry, high-speed progressive stamping machines can operate at up to 500 to 1200 strokes per minute. They generally operate at around 50 to 120 strokes per minute in the automotive industry and for general-purpose production. Aluminum has a high strength-to-weight ratio, making it a great choice for many metal stamping projects. Aluminum grades 1100, 3003, and 5052 are the most common choices for metal stamping due in part to their strength. Manufacturers can strengthen aluminum further by anodizing, which also protects against corrosion and makes the metal more aesthetically pleasing. Aluminum metal stamping can create more complex and asymmetrical shapes than other metal-shaping methods. Aluminum is extremely formable and can be used to create complex shapes and variable wall thicknesses, while tool and die components can be added to stamping machines to produce even more complex parts. 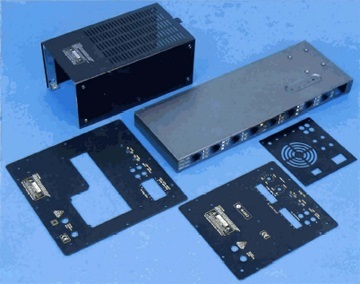 Aluminum metal stamping offers a range of benefits for thermal management solutions. Contact us online or call us at 888-999-8499 for more information about our custom aluminum metal stamping services and extruded aluminum heat sink manufacturing.